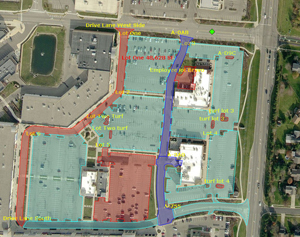 From measuring parking lots and sidewalks, to identifying lot obstacles and more, Go iLawn helps you clearly communicate your professional snow removal strategy to customers, subcontractors and crews. 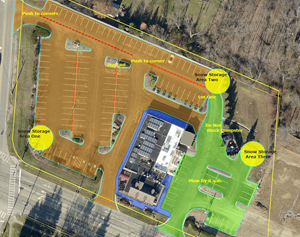 Commercial snow removal diagram indicating snow storage areas in parking lot, schedule for services and direction to push snow. Measuring parking lots, driveways and roads to produce estimates for snow and ice management can be a time consuming, laborious process- especially if you’re doing it the traditional way and using a measuring wheel. But not with Go iLawn. Our high resolution property photos and property measuring tools will help you drastically reduce the time it takes to accurately measure properties for snow removal estimates. Measure properties 24 hours a day, 7 days a week, no matter the weather conditions. Dramatically reduce drive time (labor), wear and tear on vehicles and fuel costs associated with property measurement. 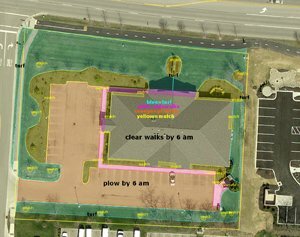 Produce professional snow removal service diagrams for clients, crews and subcontractors. Start measuring properties with Go iLawn today. Get your FREE Trial now. Unobstructed leaf-off property views allow you to measure properties during any season and any weather conditions. 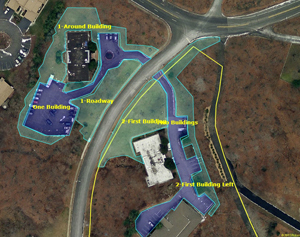 Go iLawn combines property photos and measuring tools in one easy-to-use application. 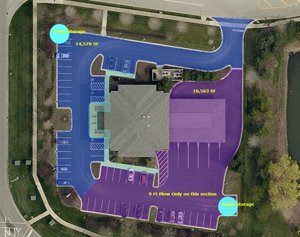 Go iLawn users can measure parking lots and sidewalks, locate and mark building entrances, identify lot obstacles and more. Need to measure a property during a snow event? No problem! Our photos will deliver unobstructed ‘leaf-off’ views, allowing you to see the bare pavement you need to measure with no tree canopies or snow in the way. Count parking stalls, speed bumps, light poles, building entrances, drains etc. Start using Go iLawn’s tools today. Get your FREE Trial now. With rising costs of deicing materials, it’s important to know how much product you’ll need to properly service your clients and get you through the season. Use our tools to help you calculate exactly how much product, how many crew members, and what type of equipment you need to get the job done. 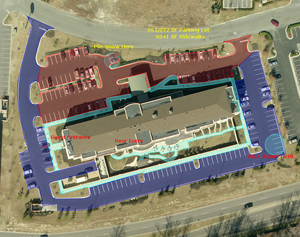 Label parking lot obstacles, where snow will be placed, what areas will be serviced first etc. Start measuring your market today.Get your FREE Trial now. 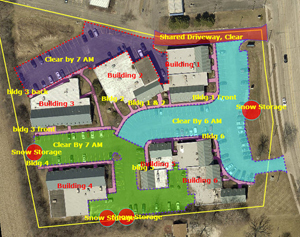 Color-coding and labeling tools make it easy to create snow removal service diagrams for subcontractors, crews and customers. Measuring on Go iLawn lets you turn your estimate around faster. It helps you measure more properties so you can bid more jobs and win more sales. Instead of wasting time driving across town from one property to the next, you’ll have more time to impress your prospects with speedy responses and fast bid turnarounds. See how you can produce better bids today. Get your FREE Trial now. You can group Go iLawn measurements into categories like ‘sidewalks’ and ‘parking lots’, with our measurement-grouping feature and your spreadsheet will be organized and subtotaled for you accordingly. Ensure a successful service delivery by preparing your crews and subcontractors, office staff, and customers with snow and ice management service diagrams. Create a site diagram today.Get your FREE Trial now. 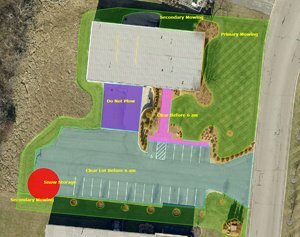 Snow removal diagram for an industrial property with special service requirements to keep docks cleared and accessible. Go iLawn pays for itself from the first time you use it. 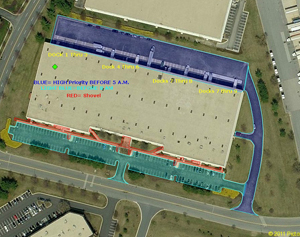 When you reduce the time and expense of onsite property measurement the savings flow to your bottom line. Plus, your resources are freed to focus on satisfying your customers – which generates more referrals. Any property can be measured with Go iLawn’s property measuring tools for landscapers. If you would like to try the Go iLawn tools right now, visit the Go iLawn test drive area where you can use the tools and saving features for free! Product demos are also a great way to learn more about what Go iLawn can do for you. Sign up for a free demo today. Or if you’re ready to get started, start a trial today. Get your FREE Trial now..